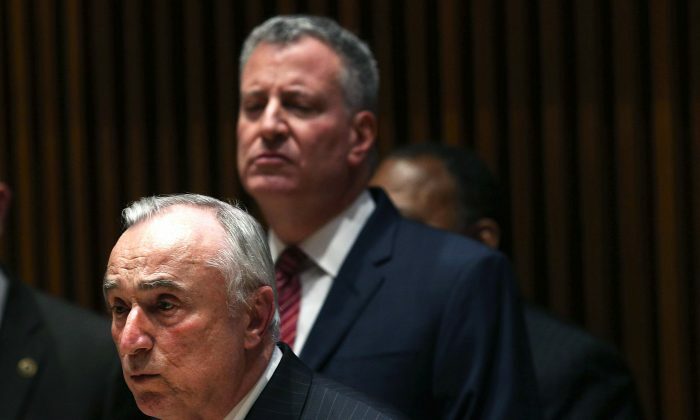 NEW YORK—Mayor Bill de Blasio and Police Commissioner William Bratton reprimanded police for turning their backs on Sunday during a funeral service and explained the citywide drop in arrests during a press conference Monday at One Police Plaza. The thousands of police officers who turned their backs on a broadcast of the mayor’s funeral remarks outside the funeral service for slain officer Wenjian Liu Sunday were “disrespectful” to the victim’s family, said de Blasio. “I can’t understand why people would behave like that,” he added. New York City Police Commissioner William Bratton called it a selfish move that came after he already called for police not to turn their backs in a memo last week. I can’t understand why people would behave like that. Officers had also turned their backs on the mayor during the funeral of the other slain officer, Rafael Ramos a week earlier, although those were mostly New York police officers. On Sunday, even police from other states joined in. After two officers, Liu and Ramos, were shot and killed in Brooklyn by an emotionally disturbed man who targeted them for their uniforms, police across the country grew more cautious and nervous about lone wolf attacks. The NYPD in particular tightened security by doubling up on patrols and guarding station houses more. In the midst of these measures, the citywide number of arrests, summonses, and traffic tickets decreased significantly, especially within the last two weeks. Drops were over 90 percent in the last two weeks compared to the same week in 2013 (ex: over 10,000 parking tickets in 2013 compared to under 600 in the same week in 2014). The large amounts of arrests in the past might have been excessive, said one retired New York police officer. Bratton admitted again Monday that police “morale is not what you’d like it to be,” which he had previously stated on several television shows. Go to City Hall, if you want to protest, don’t do it at a funeral. Bratton said that he would check each precinct, sector car, and officer in his assessment. “We’re not in a public safety crises by any stretch of the imagination,” he said, saying that he wouldn’t call it a slowdown. He also said that half the NYPD were locals and that officers knew if the city were “de-policed” it would endanger their own families. Bratton attributed the drop in arrests to the number of large-scale protests (which require personnel), the funerals of the two fallen police officers, officers doubling up for patrols, and drop in crime overall. In response to a tense mayor and police relationship, de Blasio touted the low crime rates in the city in 2014. Overall major crime is down 4.6 percent from 2013 and last year saw the lowest number of homicides since the modern policing era. “We did things that were unimaginable in terms of bringing down crime,” said de Blasio. Civilian Complaint Review Board complaints are also down 11 percent in 2014. The mayor complimented the men and women of the NYPD and mentioned the $400 million the city is investing in the force in addition to the regular budget. The money will be going toward new technology and better police training, said de Blasio. Police Commissioner Bill Bratton said 2015 would be the year of technology. There are initiatives underway to arm police officers with tablets and smartphones. The department will also enhance its helicopter fleet and expand harbor patrol. And hinting at a better relationship with police unions, de Blasio called his meeting with them last week “productive” even though it didn’t lead immediately to a resolution. He would be willing to meet with them again and again, he said. NEW YORK—Throughout the day, the rain held steady, at times relentlessly pouring down the streets lined with thousands of police officers from across the country.